The collection is complete. The fifth and final Black Bowmore, Black Bowmore 50 Year Old, was unveiled last week, joining four existing – and greatly coveted – expressions. But just how did the range attain its cult whisky crown? Dave Broom reports. Black Bowmore wasn’t the first expensive whisky; it wasn’t the first from first-fill Sherry casks (some say oloroso, others Williams & Humbert Walnut Brown, a sweet oloroso or cream Sherry); it wasn’t even the inaugural Bowmore or first single malt from Islay. Why then has it acquired and retained cult status? What was it about this batch of first-fill ex-Sherry casks filled on 5 November 1964? Quality, undoubtedly. Anyone who has been lucky enough to try any of the five releases will be able to attest to their remarkable alignment of concentration and fragrance, intensity and subtlety, smoke and fruit. Many have claimed it to be the greatest whisky experience of their lives. That doesn’t fully explain it, however. 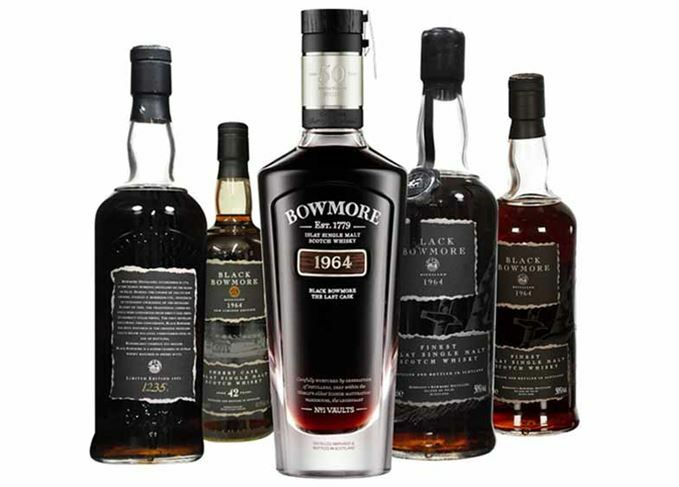 There have been plenty of other extraordinary single malts released since Black Bowmore first emerged. So maybe it was quality and timing: the manner in which its release dovetailed with the emergence of single malt whisky as a category, and the nascent collectible market. The former was known, but the latter was unexplored territory, making this a bold move by the distiller when, in 1993, it released 2,000 bottles of Black Bowmore 29-year-old. It cost between £80 and £110 a bottle. In 1993, single malt had yet to fully establish itself as anything other than a quirky speciality. Black Bowmore represented a building of momentum, suggested that the single malt drinker was, perhaps, someone who looked at the drink in a slightly different fashion. It was also the start of the Islay boom; that turning of the perceived understanding of malt drinkers’ behaviour on its head – most start and stay with light styles, only a few mad souls head to the smoke-filled monsters of the west. It also tapped into a growing love of Sherry-casked whisky. Black Bowmore’s release suggested that there could be another dimension to malt. It worked sufficiently well for another 2,000 bottles of a 30-year-old to come out in 1994, then a further 1,182 of a 31-year-old in 1995. Each time, the legend grew a little more. The price rose, but only slightly, with £90 the lowest asked for the Second Edition, while the Third Edition went over the £100 mark with prices between £100 and £150. As Thierry Bénitah, CEO of La Maison du Whisky, said recently, whiskies were undervalued at the time. Drinkers appreciated their quality, but naively thought that the steady flow of fantastic bottlings would never stop, that prices would never rise, that these were gifts from a grateful industry to impecunious seekers after flavour. With hindsight, how could anyone believe that any business would continue to sell its rarest products at bargain prices? When the fourth release, a 42-year-old, came out in 2007 as part of a trilogy alongside White and Gold, everything had changed. This batch contained 827 bottles and the price had risen to £2,400. Scotch, that apparently uncouth, hairy-arsed spirit from the north, was now planting its muddy boots on the banqueting table, long exclusively occupied by Cognac and fine wine. The industry had sharpened up and seen that it couldn’t and shouldn’t give away its most prized offerings. Luxury had become the new buzz word and, if Château Pétrus could do it, then why couldn’t whisky? It, too, was rare, precious and, in Black Bowmore’s case, had sat in cask for a huge length of time. It is fascinating to look back on contemporaneous reviews and comments at the time of the 42-year-old’s release. While there are some who complained about the hike in price, there is a surprisingly large number of people who are accepting of the move, pointing out that there are bars offering it for sale, and whisky clubs getting together to buy a bottle and sharing it. Whisky auctions had by now started and, while the word ‘investment’ was beginning to appear in reports and comments, its use was infrequent. In 2007, it would seem, whisky was still more about the drinking – even at this rarefied level. Something else had changed, however. Now knowledge had deepened; old wasn’t necessarily viewed as good; wood was both an aid and a potential enemy. Additionally, there was a deeper understanding of specificity. The first three releases were about the Sherry, about the blackness. Now it was more about Bowmore. Yes, the quality of the wood was vital, but that understanding was now balanced by the skill of the men in the malt barns and distillery, while the whisky’s most mysterious element – the location of the casks – was being given equal billing. If you look at Black Bowmore as fiction, you see it grow from being a simple tale about a product into something which acquires the trappings of legend and myth. What was once ‘Islay’ had been condensed into distilleries; distilleries compressed into specific peculiarities – in Black Bowmore’s case, the magical, never fully explicable weirdness of the conditions in No 1 Vaults, one of walls of which sits below the level of the loch outside; a place of cold and damp, where evaporation is minimal, where elements are both preserved and warped into new shapes, where time slows and things deepen. The fourth release confounded widely accepted truths: you can’t keep whisky that long, and you certainly can’t keep it that long in first-fill ex-Sherry. Its quality showed how sometimes, when the cards fall in the right way, cask, spirit and conditions harmonise in a remarkable fashion. Five years later, the luxury segment took off properly and prices headed ever upward. Not that it seemed likely that Black Bowmore would ever play in that realm. Or would it? Hadn’t the 1995 release called itself the ‘Final Edition’, only for another to appear? Even so, it seemed unlikely, which made last week’s launch of the Fifth Edition all the more surprising. Like the prior quartet, this newest release reflects how the market has shifted. Black Bowmore is now 50 years old. There’s only 159 bottles left and they cost £16,000 each. In addition, the packaging has utterly changed. The first three editions were in plain bottles and simple wooden boxes. While the box for the fourth was slightly more expensive-looking, the bottle remained simple. The modesty of the presentation reflected the importance of the liquid. For the Fifth Edition, however, the glass is sculpted, hand-blown and polished, and a cabinet maker has been commissioned to make the presentation case, each one of which takes 70 hours to craft and uses 80 different hand skills. Is it another whisky designed to be a rich man’s plaything? A triumph of bling over substance? Undoubtedly, some whiskies fall into that trap, but that can’t be said to be the case here. Yes, ultimately the liquid is what matters, but rare whisky is no longer the little-known, specialist world it was in the ’90s. The whisky is still extraordinary – now what contains and holds it has to be equally so. This area of whisky has moved into uncharted territory. What it leaves in its wake, however, is an increasingly polarised reaction with regard to price. Gone is the glee and amused bafflement which greeted the cost of the first three editions, the resigned acceptance of the fourth. Now, anything with a high price tag is castigated. Black Bowmore has always existed at an extreme: in flavour, in age and in price (even when it was under £100). The reaction to each element has evolved over these past 23 years. The saga of Black Bowmore is that of quality, concentration, place, craft, the market and our response to what whisky is, and what it means – a tale as complex as the dram itself. Fifth single malt of pioneering series, Black Bowmore 50 Year Old, priced at £16,000 a bottle.